The reality check of winter catches up on us but we can make it that bit better by giving ourselves some TLC. Reach for the hot chocolate and put some slippers on – here’s our top six top tips for beating the winter blues. Sleep less, but sleep well – Yes, we know its tempting to sleep more in winter but don’t be inclined to reach for the snooze button. Spending too long in bed is no good for your mood and leads to feeling groggy. Equally, poor sleep can lead into a downward spiral so make sure you have a comfortable bedroom and a comfortable temperature! Berries – Healthy, reduce stress. Hot choc – keeps you warm, the low cal type. Soup – comforting winter food. Relax in the bath – Bath bombs, hot water and smellies is definitely what we need to destress in winter. Make time for exercise – it’s easier in summer to walk to the shops, or to work. However, just because it’s chilly outside, it doesn’t mean we should abandon exercise altogether. Just half an hour to 45 minutes is recommended and there is plenty of indoor exercises too. Enjoy the outdoors – Breathe in fresh air and soak up natural daylight to make you feel happy and healthy, even in the winter months. 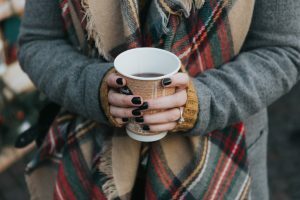 Keep warm – Potentially the most important, reducing winter stress by half! Keep warm with hot drinks, hot food, warm clothes and definitely warm shoes.